All gemstones made by Charles & Colvard. The brilliance and fire inherent in your moissanite gem(s). The coverage for your Charles & Colvard gem(s) are subject to the terms as outlined below and as set forth on your Limited Lifetime Warranty card. In the unlikely event the optical properties of brilliance and fire alters in a gem(s), please contact Moissanite SA and we will take this up directly with Charles & Colvard. Each warranty applies only to the original purchaser and is non-transferable. The Limited Lifetime Warranty on your gem(s) does not cover: chipping, breaking, scratching, abrasions, or damage as a result of abuse, misuse, loss, or theft of your gem(s). Charles & Colvard does not endorse or approve any third-party alterations or treatments to any Charles & Colvard Created Moissanite. Such processes may be temporary and could lessen the durability and value of the moissanite gem(s). Accordingly, any third-party alterations or treatments will void the Charles & Colvard Created Moissanite Limited Lifetime Warranty. Any third-party alterations or treatments to your gem(s) will void either warranty. Your purchase including the Limited Lifetime Warranty or the Limited Warranty, whichever applies, is governed by the substantive laws of North Carolina without giving effect to any conflict of laws provisions. Charles & Colvard is dedicated to creating and delivering socially-responsible gemstones that last a lifetime. Part of the promise is to provide a first-rate customer experience by making products that exceed expectations. With every gemstone Charles & Colvard offer a certificate of authenticity and limited warranty, so you can enjoy your moissanite with confidence. The Charles & Colvard moissanite gemstone you have purchased from Moissanite SA is authentic Charles & Colvard Created Moissanite and is the result of more than twenty years of innovation and refinement. Skilled technicians carefully select rough blocks of raw moissanite, looking for the lines of pure brilliance hidden inside. Master gem cutters polish and facet each one, patiently drawing out the gem’s full beauty. Your moissanite gemstone was manufactured by Charles & Colvard to meet its rigorous specifications and is held to a higher standard through Charles & Colvard’s Limited Warranty’s guarantee that your Charles & Colvard moissanite gemstone will retain its fire and brilliance during your lifetime. Authentic Charles & Colvard Created Moissanite is also environmentally and socially responsible and leads the way for conflict-free choices in the industry. 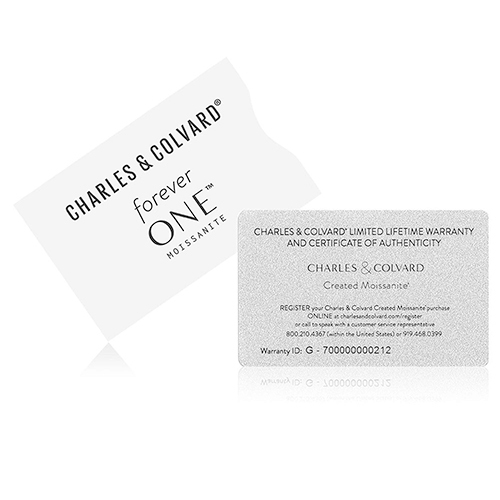 Charles & Colvard recommends that you retain your warranty card and purchase invoice.